Disclaimer: The opinions expressed in this post are entirely my own and uninfluenced by compensation. Your experience with the product may differ from mine. The sponsor is responsible for prize fulfillment and shipping. This giveaway is sponsored by Boba and hosted by Suchamom.com. I have teamed up with them to help bring you this amazing giveaway! 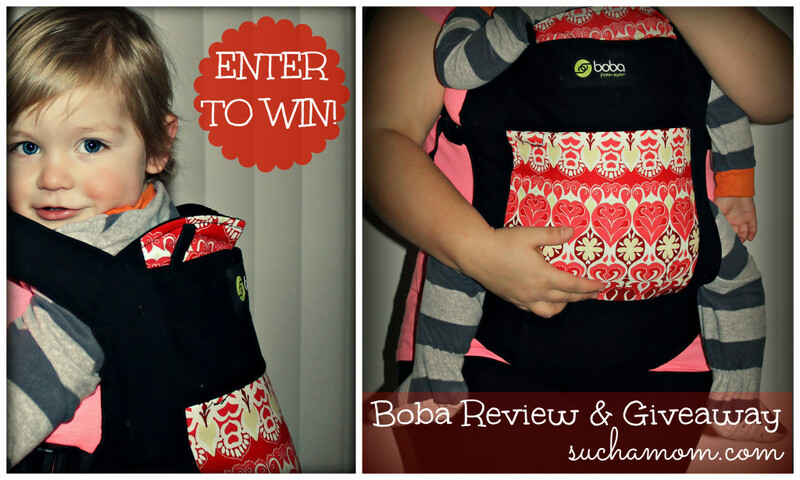 The Boba Carrier 3G was awarded the 2012 Top Baby Carrier pick by Baby Center. They know baby carriers! The Boba Carrier 3G is not only for babies but toddlers as well. The new infant conversion option lets you use the Boba Carrier 3G with babies over 7lbs. No buying a new carrier as baby grows! This carrier can also be worn on the front and back! Check out more of the great features it has to offer here. Not only is this carrier durable and convenient, it is adorable as well! To read the full review, go here. I love the LILA one!!! Would love to own a Boba! I like the Dusk color! Would love to have “Dusk”. I like the Montenegro Boba Carrier. I would get the Lila one!